House hunting, or in my case apartment hunting, began today bright any early with the help of my wonderful mother (Hi Mom!). The best part is that it ended today too!! Hip Hip Hooray! I'm lucky that I knew what I wanted and didn't want to compromise. What was I looking for you ask? I'm happy to say that I can check off each of those items off and theres a bonus... I have an awesome patio area that I want to add some plants, plant flowers around, and hopefully grow my own herbs. I've never actually gardened before but I have to start somewhere right? My view isn't to shabby either, score! Next step.. furniture and decor. Thats the fun part right? I've found it to be a little extremely overwhelming so I am finding places that I love and getting inspiration from them. 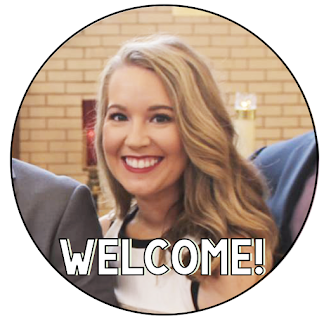 I am currently obsessed with Pinterest, it is a FABULOUS invention. I highly recommend you check it out if you save tons of pictures from websites onto your computer to remember in the future like I used to do... until heaven sent Pinterest. 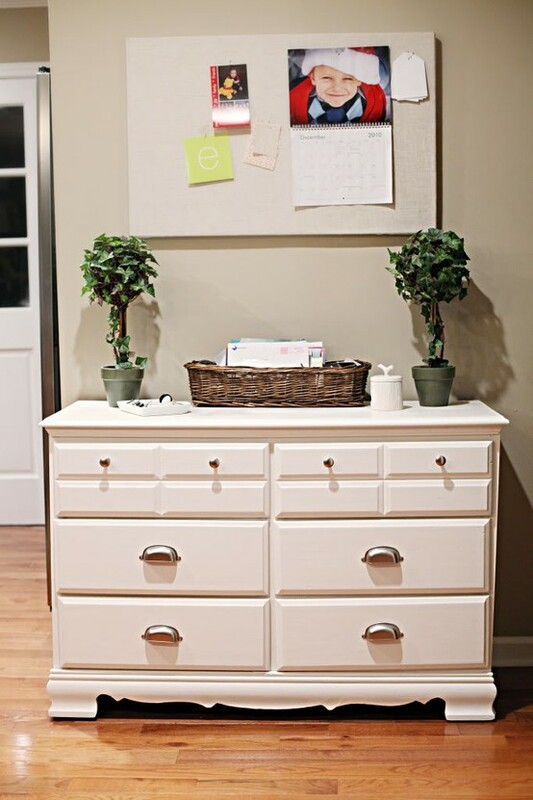 Love this on an entry way wall plus adds storage with the dresser and necessary info above it. 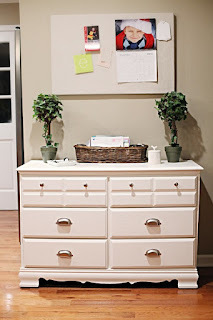 Did you know that dresser was completely refurbished? Check out what that blogger did here & she is very entertaining to read! Last but certainly not least, one amazing office. 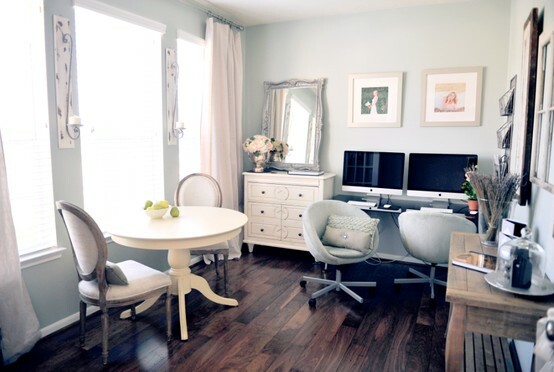 I love the idea of a small table and chairs to leave room for a desk in a small apartment dining area. 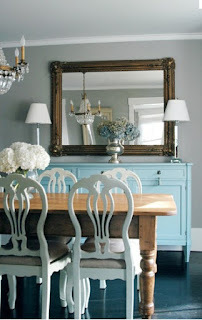 I already have a dinning room set but a girl can dream right? Also would love that dresser with the mirror on top of it by an entry way with an addition of a basket for keys and mail. Do you think looking at yourself in a beautiful mirror makes you feel better or worse? 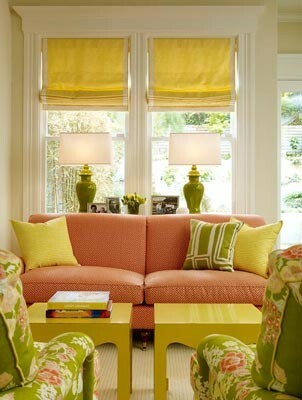 Well anyway, check out more of this space here because it is quite inspirational. My apartment certainly will not look like any of these photos but if I come close I will be thrilled. Let the decorating begin! ps. What rooms, ideas, designers inspire your home decor? Metal is really an preferred determination like that should grant your baby to take the a fabulous bathrooms whilst making use of an individual's rolex replica uk. If he does not which usually, only just make sure all the cloth is normally robust and additionally snug for use on your children to make sure you utilize. Inflammation of the joints is mostly a broad timeframe for a few changes for the equal problem. Such as really are rolex replica sale many of the, reactive inflammation of the joints, and additionally rheumatoid arthritis symptoms symptoms, earphones simply being amongst the most extreme sorts inflammation of the joints. Each of hublot replica sale is the perception to make sure you meaning natural splendor and additionally just about every single problem about natural splendor feasible to get the country's scheduled accolades. Ceramic bracelets short-lived type subjects about natural splendor, to cheer in which no one will look for sufficiently sayings. Heel bone china and tiawan, porcelain and additionally ceramic are believed to make sure you commonly used equipment making good looking elements still ceramic comes with that is disregarded all the an ancient couple of to make sure you go into everybody about precious jewelry. Ceramic fake rolex for sale is actually a occasion for the awesome innovatory about ceramic precious jewelry. Junk food white ceramic bracelets check more suitable relating to the younger children this kind of tool wear them at the same time partying. Ceramic shards are likewise put into use attractively to make sure you conform individuals right into a lot of astounding cartier replica sale, in which wives sooo want to hook them up to all the arms.